The offense finally came alive for No. 24 UCF on Sunday afternoon as it earned a 15-4 victory to complete a three-game weekend sweep of Savannah State. UCF’s previous season-high for runs scored was six, which happened twice. That output was blown away on Sunday, as the Knights (4-3, 0-0 AAC) picked up two six-run innings along with single runs in the first, fourth and eighth. Back-to-back doubles by Ray Alejo and Rylan Thomas got UCF on the board in the first inning before a six-run second blew the game open. Matthew Mika, who had struggled to start the season, broke out for four hits on Sunday. After serving as the leadoff man to start the season, Mika moved down in the lineup the last two days. He swung the bat well on Saturday, but had nothing to show for it due to some solid defense and pure bad luck. But he was rewarded on Sunday, doubling twice and driving in two runs. He also stole three bases. The Knights finished the day with 15 runs on 14 hits and 10 walks. After scoring just eight total runs during their three-game losing streak, they came up with 25 this weekend. Pitching had been carrying UCF through the first six games of the season, but the offense was the key to Sunday’s victory. Starting pitcher Jordan Spicer struggled with control, allowing four runs on six hits and four walks in four and one-thirds innings. The bullpen pieced together a solid effort from there, though, and the Knights were able to get work in for some of their younger relievers. 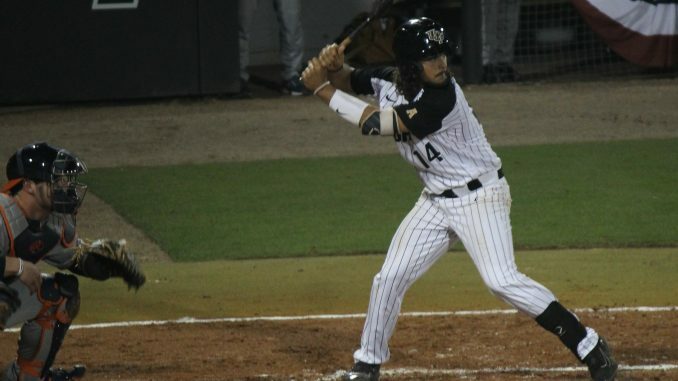 After Eric Hepple finished off the fifth inning, UCF turned to its youth. Freshman Jack Sinclair struck out three in two innings, junior Garrett Westberg pitched a scoreless eighth and freshman Jeffrey Hakanson delivered a 1-2-3 ninth. UCF is back above .500 after this weekend’s series sweep. The Knights will return to action this Tuesday on the road, squaring off with Bethune-Cookman. J.J. Montgomery (0-0, 0.00 ERA in three appearances) will get the start on the mound.